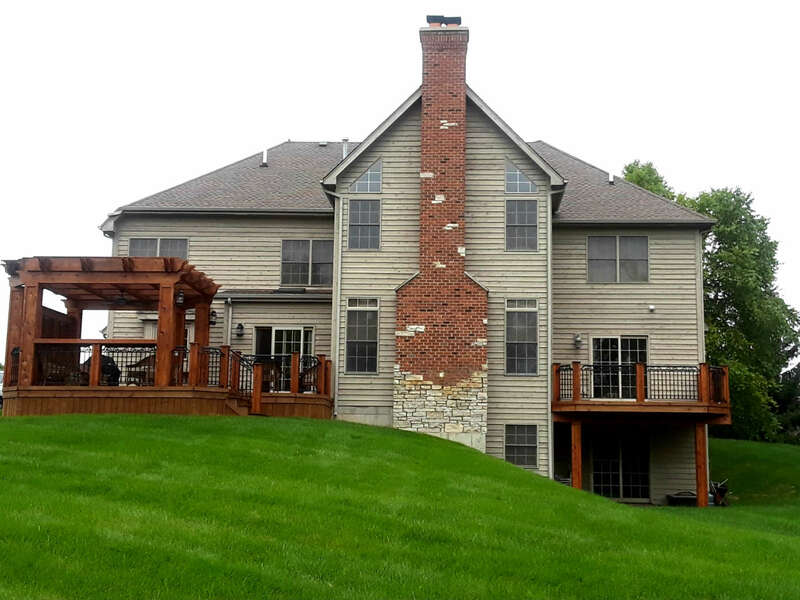 Are you looking for a St. Charles porch builder with experience building porches in St Charles IL and throughout the local area? Look no further than Archadeck of Chicagoland. 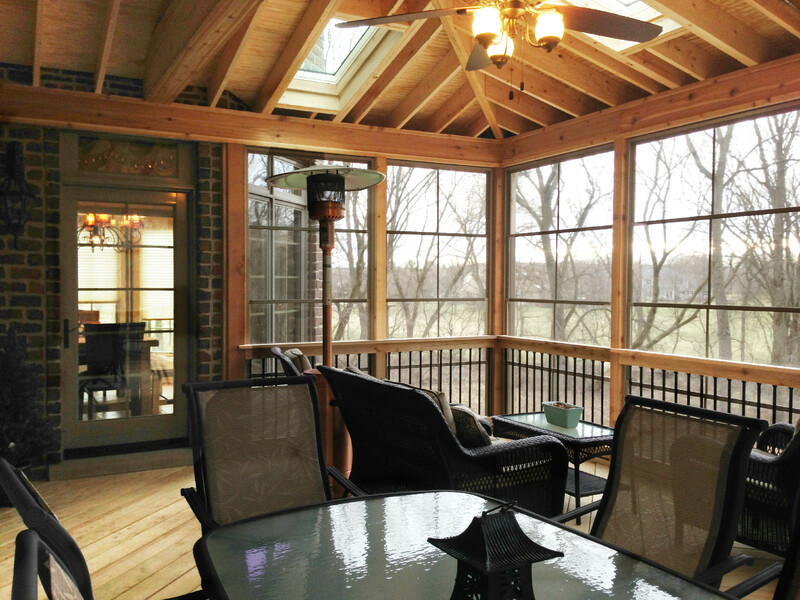 For more than 25 years, we’ve been building porches in St Charles and throughout the local metro area. 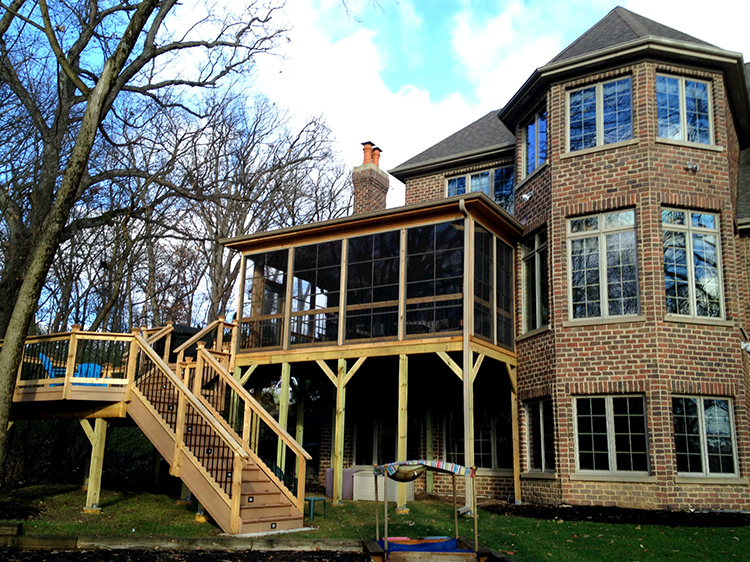 The 3-season porch above is built to include an Eze-Breeze clear vinyl window system. The Eze-Breeze window system includes 4-track windows that allow you to open them up to 75% or to full close them for some protection from rain or temperature. As you see in the photo above, a space heater allows you to use your 3-season porch in some of the colder St. Charles months. This porch has a couple of skylights to allow more light into the room. The think black railings allow maximum visibility into the backyard. The gorgeous home shown above includes outdoor living spaces in multiple areas around the back of this home. There is an elevated deck on one side and another deck at grade level on the other side of the home. That deck comes complete with a statuesque pergola. A pergola is a tremendous addition to either a deck or patio. Pergolas can perform different functions depending on your needs and wants. You may be looking to add a pergola for its majestic stature and the improved aesthetic it will add to your outdoor living area. Or, you may be looking for a level of sun protection. Your Archadeck design consultant will work with you to add as much or as little sun protection as you would like. A pergola is not a solid roofed structure like an open porch but quite a few design techniques can be utilized to achieve a good degree of sun protection. 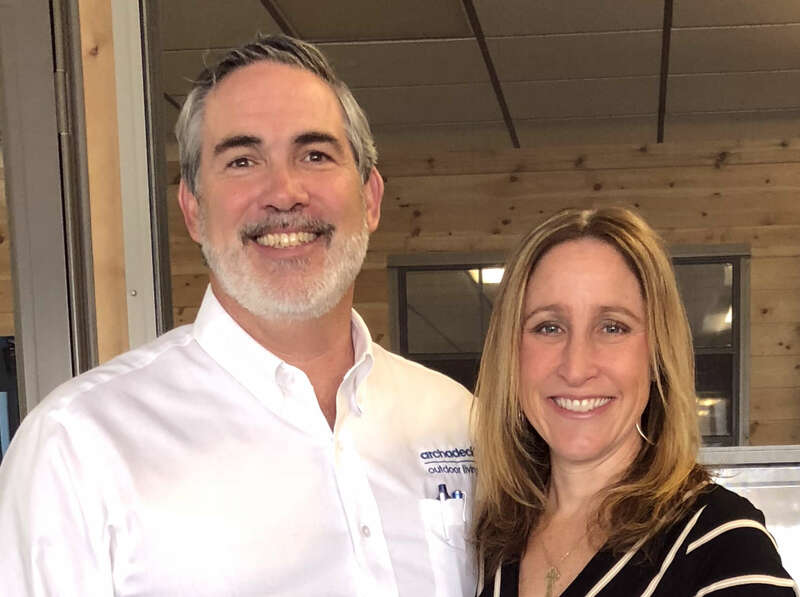 As you can see in the image above, Archadeck builds custom decks designed for the needs, tastes, features, and budget of each homeowner we work with. 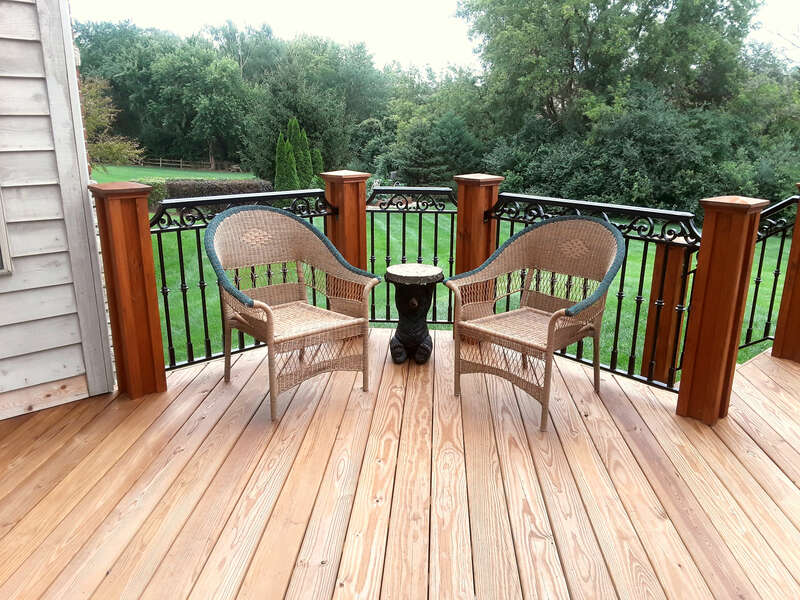 The deck picture above is a pressure-treated wood deck with ornate iron railings and statuesque wide railing posts. This is a great way to make the deck a little more economical while still adding some great custom flair and design. You can see that Archadeck’s installation techniques ensure your new deck has the upscale look you are seeking from a St. Charles deck builder. 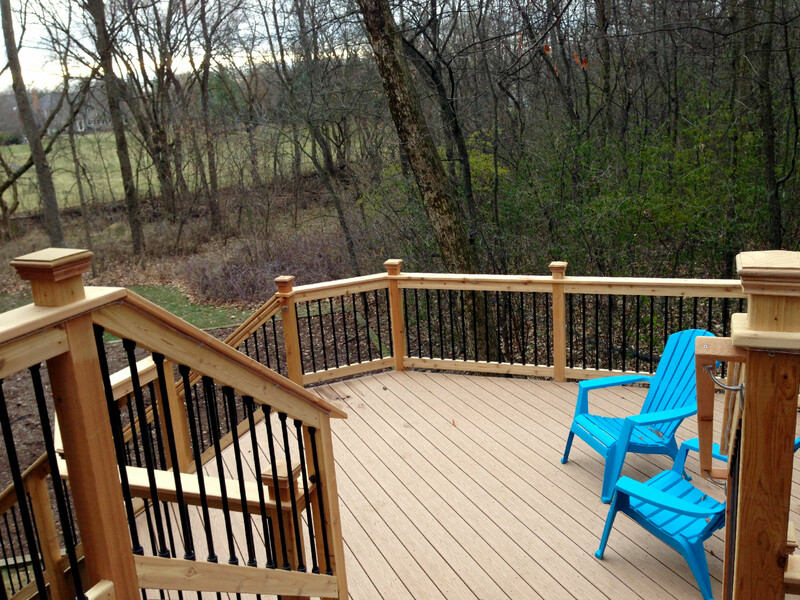 The decking boards in the deck above are installed at a diagonal for aesthetic appeal. A corner railing panel adjoins the 2 larger panels for another custom touch. Above is a fabulous custom outdoor living space that includes both a low-to-grade deck as well as a paver patio. Many homeowners enjoy the zen-like appeal of a deck with no railing. Depending on local code and how high the deck sits off the ground, you may not be required to add a railing. This deck did not require a railing which allows it to flow seamlessly to the lower level patio down below. Every home is different and so is every Archadeck design. Whether your St. Charles home has 3 levels like the beautiful home picture above or whether it’s a ranch, we will build a space to suit your needs. Very popular with St Charles homeowners are custom spaces that include multiple outdoor living areas. 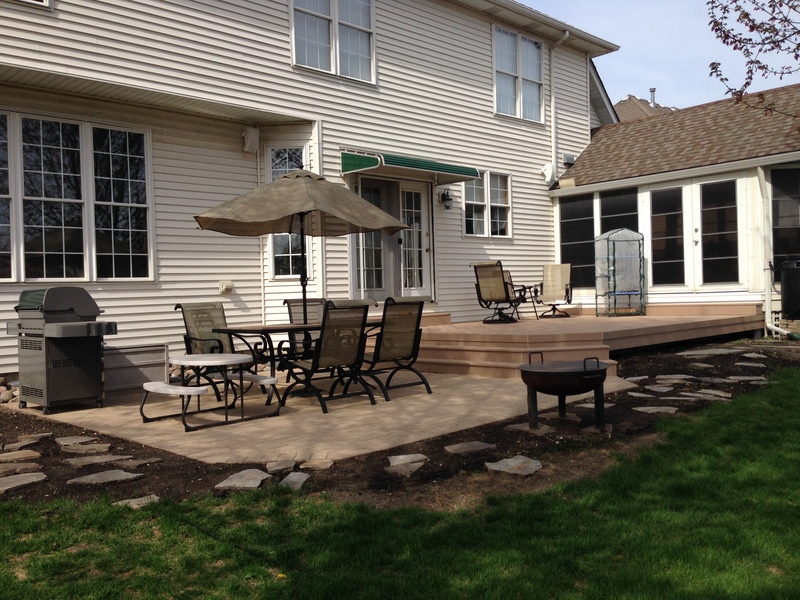 This space not only includes a porch and deck but the deck is also multiple levels. In addition, the covered porch area creates yet another outdoor living space on the patio below the porch at walkout level. The best outdoor living space is the one that suits your family’s needs and how you want to live outside. You may be looking to add a small yet creative and custom space for the occasional days you spend time outdoors. The hardscape above is designed in a custom shape for visual appeal and for a custom touch. 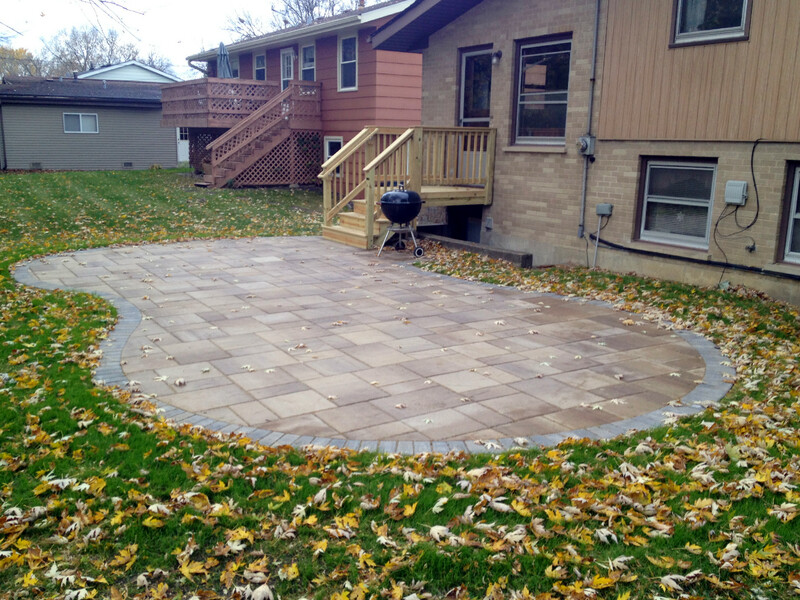 The patio includes square paver blocks along with a contrasting block used for the border. 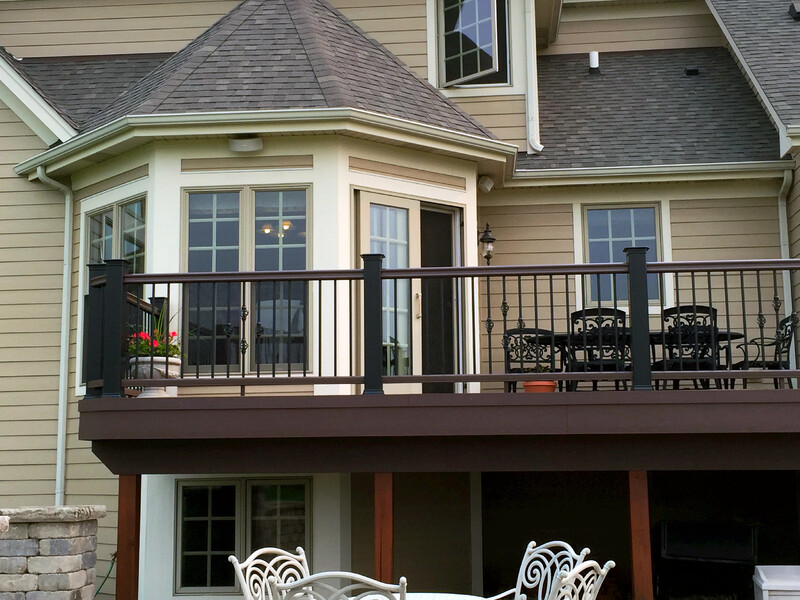 Choose Archadeck for your St. Charles IL patio builder. Many homeowners ask us where to begin when designing the perfect outdoor living space for their home. What’s important is to think about how you want to live outside. Do you want to dine outside? If so, do you want to regularly have guests dine outdoors with you? Are you looking for seating? For how many? Do you want a combination outdoor living area for your St. Charles home? A combination space includes more than one structure such as a porch/patio, porch/deck or deck/patio. More and more homeowners are opting to have their dream space built to really enjoy the outdoor living they’ve been waiting for years to enjoy.